Oxford rejected a motion to join the BDS by a margin of seven to one. In his recent broadside against British Jewry, Shmuley Boteach laid into the whole community for its perceived “uncomfortable silence” in the face of anti-Semitic and anti-Israel activity in the UK. Only the Zionist Federation and the Israeli Ambassador are granted a reprieve. What was particularly bizarre about this polemic, however, is that despite the frequent mentions of Oxford, Rabbi Boteach totally overlooked some key events at Oxford University in the last few years, and thereby falsely and unfairly implicated Oxford’s Jewish students in this alleged conspiracy of silence. So as a recent Oxford graduate, allow me to set the record straight. Rabbi Boteach alludes to the “utterly astonishing proposal to bar Israeli academics at Oxford University”, referring to an attempt by two radical leftist students in February to get the university student union (OUSU) to propose a boycott of Israel at the conference of the National Union of Students (NUS). What he conveniently forgets to mention, however, is that this motion was defeated by an astonishing margin of seven to one. This staggering defeat of the BDS at Oxford did not happen by sheer dumb luck. Rather, it was the product of a tireless campaign waged by Oxford’s Jewish students to persuade their peers to throw the motion out. After OUSU postponed the vote in order to give Oxford’s 38 constituent colleges two weeks to deliberate on how to vote, we made sure that we had someone in every single college who could present the argument against the boycott. We argued our case in the student press. We made national headlines in the UK. We also set alarm bells off in the Israeli media: I was even interviewed on Israeli army radio! We won the battle by mobilising effectively to win the argument: that’s how we convinced Magdalen College, for example, to reject the boycott by 39 to 3. Thanks to campaigns like ours, and the work of the Union of Jewish Students, the motion at the NUS conference collapsed. The inference from Shmuley Boteach’s article, however, is that instead of fighting back, we lay back and thought of England. 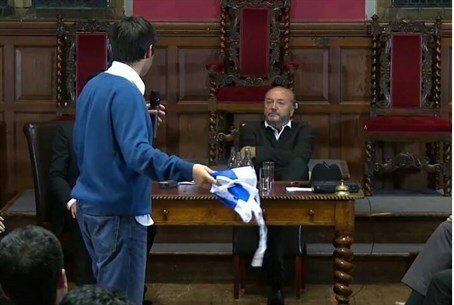 It is also remarkable that Shmuley Boteach mentions firebrand MP George Galloway and the Oxford Union in the same breath without also mentioning that two weeks ago, history student Jonathan Hunter confronted George Galloway in the Oxford Union chamber, waving an Israeli flag. “I don’t debate with racists,” Jonathan said as he stormed out, parodying Galloway’s own utterances when he himself stormed out of an Oxford debate with yours truly, fulminating, “I don’t debate with Israelis.” Galloway’s visit to the Oxford Union was followed by an op-ed in the student newspaper denouncing him as a “nasty, self-indulgent egomaniac” whose “style of argument [that] shouts down rational inquiry” meant he should not have been welcome in Oxford. Rabbi Boteach then writes, “When I was in Oxford, I had never heard reports of Jewish students afraid to publicly identify as Jewish, or wear a Yarmulke”. When I was in Oxford last year, I heard no such thing either. Boteach continues to say that the late Isaiah Berlin disliked the giant menorah in central Oxford during Chanukah; be that as it may, we love it, and Boteach is wrong to suggest that Jews feel like second-class citizens in this country. The picture that Boteach presents of a community cowed into quiescence is false and frankly rather offensive. Don’t get me wrong: we have a long way to go. There is undoubtedly a strong tendency among Jews to keep a low profile when it comes to Israel, for fear of inviting unwanted attention or provoking anti-Semitism. When I was in Oxford, I was sharply critical of the Jewish Society for refusing to publicly denounce the boycott proposal. Jewish students mobilised as private individuals, but the JSoc declined to associate itself with any pro-Israeli (or anti-anti-Israel) activity. This was, and remains, a mistake. After the infamous “Zionism is Racism” resolution at the UN in 1975, university student unions started shutting down Jewish societies for their “racist” affiliation. If a boycott of Israel is normalised, a boycott of groups and individuals associated with Israel will surely follow – and that means Jews. That, if anything, is why Jewish students must be more proactive in opposing bigoted anti-Israel initiatives: they’re next. British Jews can and do hold their heads up high. For Boteach to suggest that we do not believe that we are the “absolute equals of every other British citizen” is a gross distortion of reality. Perhaps Boteach should return to Oxford for a visit: he may well like what he sees.